Celebrating the release of Gran Turismo Sport and marking 20 years of Nissan involvement in the Gran Turismo gaming series, the one-off project car was extensively modified to be driven entirely by a DualShock®4 controller. Gran Turismo Sport will be released in the US on October 17, Europe and Australia on October 18 and Japan on October 19. 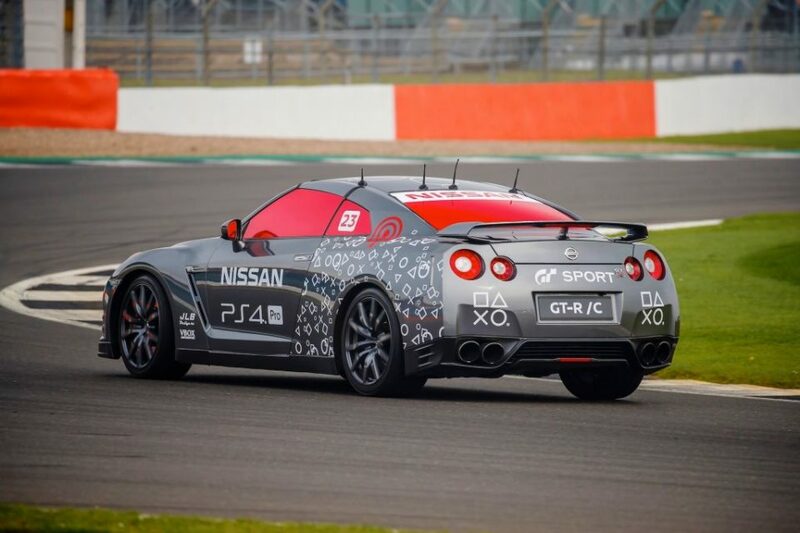 The GT-R /C was put through its paces by Super GT NISMO racing driver and GT Academy winner Jann Mardenborough, around Silverstone’s famous National Circuit. Mardenborough controlled the GT-R /C from the cockpit of a helicopter. On Mardenborough’s fastest lap (1:17:47), the GT-R /C averaged 76mph/122kph and reached a top speed of 131mph/211kph. The GT-R /C is fitted with four robots that operate the steering, transmission, brakes and throttle. Six computers mounted in the rear of the car update the controls at up to 100 times a second. The unmodified DualShock®4 connects to a micro-computer which interprets the joystick and button signals and transmits them to the GT-R /C’s onboard systems. The wireless operation has a primary control range of one kilometer. “This was once-in-a-lifetime, truly epic stuff. The GT-R /C has brought my two worlds together – the virtual of gaming and the reality of motorsport – in a way I never thought possible,” Mardenborough said. “The response from the car when using the controller was far more engaging than I thought it would be. JLB Design has done an incredible job at making everything respond really well. “Steering, acceleration, and braking were all intelligently configured, allowing for controlled application so I could really get a feel through the corners and hold it steady down the fast straights.